Bangladesh confirmed their maiden final berth in the SAFF Women's Championship with a 6-0 mauling of Maldives in the second semifinal at the Kanchenjunga Stadium in Siliguri yesterday. 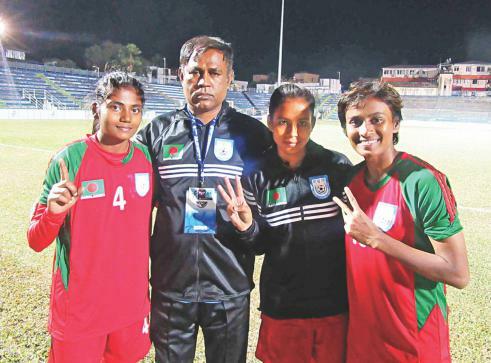 Young striker Sirat Jahan Swapna scored a hattrick while captain Sabina Khatun bagged a brace and centre-back Nargis Khatun added another as Bangladesh made it to the final of the competition after having been eliminated from the semifinals twice and the group stages once. Golam Rabbani Choton's charges will play the final tomorrow against hosts India, who had earlier in the day confirmed their fourth successive final after beating Nepal 3-1 in the first semifinal at the same venue. The final will be a replay of the group fixture where Bangladesh had held their mighty neighbours to a goalless draw to clinch the top spot in the group after having made a flying start to the competition with a 6-0 win over Afghanistan. The women in red and green wasted little time to establish their supremacy over Maldives, whom they had previously beaten twice – first time by 3-1 goals in the 2014 SAFF Women's Championship and then by 2-0 goals in the 2016 South Asian Games. Young striker Swapna hogged the limelight with a hattrick as well as turning provider for two more goals. The lanky forward broke the deadlock in the 13th minute with a solo effort before doubling the lead 11 minutes later as she turned in a through-pass from fellow striker Sabina. The women in red and green did not add any more goals in the first half, but wreaked havoc at the Maldives defence after the restart, scoring four more within first 13 minutes. In the 48th minute, Swapna whipped in a well-judged cross for Sabina, who bagged her sixth goal of the campaign with a placing shot before Nargis made it 4-0 four minutes later by smashing home a through-pass from Swapna. Swapna then completed her hattrick in the 56th minute with a solo effort as she ran down the left to advance into the box and drive past Maldives goalkeeper. Two minutes later Bangladesh were awarded a spot kick when substitute midfielder Marzia was brought down by Maldives captain Marium inside the danger zone. Sabina stepped up and calmly found the net to complete the rout. The prolific striker did have an opportunity to strike her second hattrick in the tournament eight minutes later, but she failed to turn home a rebound.